If you look at movie studio stills from the Golden Age of Hollywood - you know, the black and white photographs of the "Titans" of film - chances are they'll be holding a martini or smoking a cigarette or checking their watch as if they’re about to catch a train. Whatever their activity, if you look CLOSELY at their wrist, they'll be wearing a great looking timepiece. This was an era of such staggering class it will never, ever be fully appreciated, much less duplicated. The same thing can be said for the watches produced during this era of style and function. Sadly, no matter how much money you spend on a modern watch, you won’t be able to duplicate the styling, shape or coloring of the old classic timepieces. New watches are like remakes of classic films: They're never as good as the original. 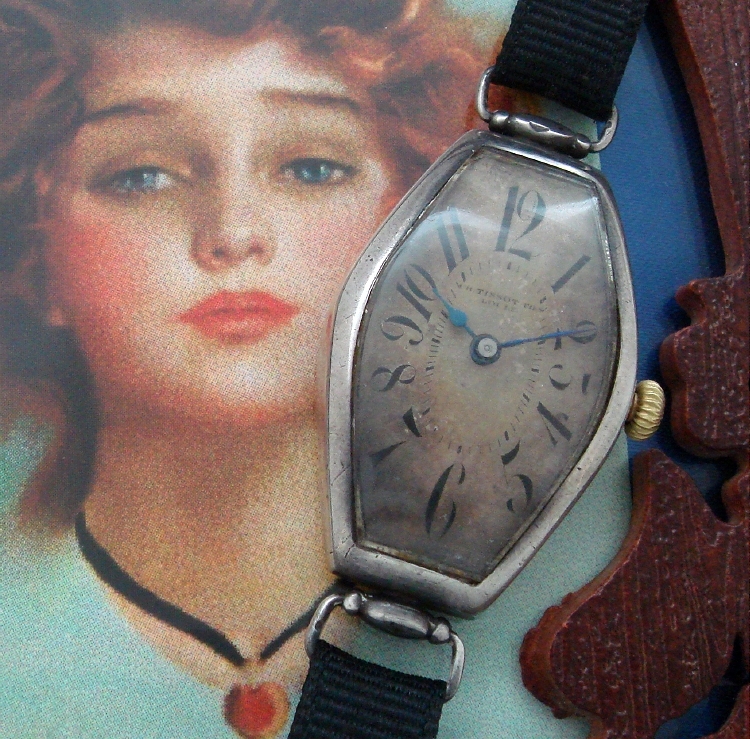 Take, for instance, this ladies early Tissot wire-lug tonneau wristwatch, measuring 23mm wide by approx. 50mm lug-end to lug-end. Its "exploding" numeral dial, originating in Paris during the teens, was thought to have been inspired by Toulouse Lautrec; and that such dials, in turn, helped inspire the Deco movement itself. The marks of "Ch. Tissot Fils/Locle" as well as the exploding or exaggerated numerals on the dial are wonderful and completely original. The solid sterling silver case has a pleasingly fluid style, complementing the dial well. Its hinged back opens to reveal lion passant and silver markings, as well as a cleaned, oiled and timed movement. Such a gilt mechanical marvel is almost as attractive and the case and dial. We believe this watch to have been made in Switzerland by Tissot for the English market. The piece made its way to the States, where apparently it was tucked away in a rather well-heeled estate before being acquired by us. In addition to sleek tonneau case in sterling, the watch features a period ribbon strap and matching buckle. We are delighted to fit the watch with a new ribbon or provide it for the recipient to use if she so chooses.